Isn’t it amazing how quickly the core values of these people disappear when it doesn’t suit. Apparently, the synagogue suggested they did not want to take sides. Take sides between who? Yet if you return to the event schedule above, you will notice that Yachad are holding an event on 5th September at the same synagogue. Open debate and the provision of a platform are not a one way street. Why are ‘Im Tirtzu’ denied but Yachad allowed? I can assure you, Yachad are deeply controversial in our community. Did the apparent presence of the Yachad chairman on the board of management at HGSS make a difference? Follow the FB page for this blog: and follow me on Twitter. Please if you can, also consider making a small donation. Research is expensive and time consuming. Simply producing just one of these piece does take days, sometimes weeks, and whilst I do what I can, there are serious constraints that impact on what is possible. No, it normal many America Jews no longer support Israel. Jewish Traitors. Apparently Hannah Weisfeld, Director of Yachad, was at the press launch of Chakrabarti’s report on antisemitism and other forms of racism within the Labour party, an event which was not open to the public. Why was she there? Had she been asked to attend by the BOD or JLC or the Office of the Chief Rabbi or somesuch communal body to represent the Jewish community; and if so, why was she selected? Or was she invited because the organisers regard her as a ‘good’ Jew ie one that criticises Israel and blames it for all the problems in the ME but who never suggests that the Arabs might even be in part to blame and who has stayed silent on the subject of Jew-hatred and Israel-hatred within the Labour party? After Baroness Whitewash can we expect to see Baroness Quisling? Charlie what exactly did you not like about the chak report ? The contents and the conclusions. Like all of it ? Dullamy, You get around, like a hairball circling the drain. If I were you David , I would look again @ Im Tirtzu’s attempt to silence Leftist NGO’s in Israel by the use of the courts . What type of organization tries to outlaw their adversaries or free speech ?! You may not like the word and you may certainly not like it applied to Israel — and I have no doubt that they have a “sweet talk” prepared for the UK audience, but not all Zionists are the same. In fact, the more the Right in Israel gets entrenched in power, you see this more and more . They try to circumvent the Supreme Court, they give outrageous amounts of money and political power to Orthodox political parties — in exchange for their political support, and they offer not a shred of hope of a brighter future. Israel has had a generation now without hope. You have no idea how detrimental that has been to the Zionist dream and the mentality of our youth… with youth alcoholism and violence at an all time high. And like Im Tirzu , the lack of hope has turned some to see power as the only solution. These people look at the peace with Egypt or Jordan like something that had happened to some other people (and not something that came at great personal and political cost to both Left and Right) . Zionism should strive equally towards defense of the Jewish people but also to peace… — or we are not worthy to say Shalom to each other as a greeting. These are the people who do not value peace. Not with the Palestinians, not with the Jordanians , not with the Egyptians nor between them as the Right and others who are on the Left . They don’t value dialogue… , and they don’t value walking softly… only the carrying of the big stick. They are not about togetherness as a people, but rather about “it’s our time now / it’s our turn” . They are intellectual thugs , and at times calling them Fascist is being generous. Nationalism ,Messiahnism and the parasitic existence of the ever growing Orthodox community are the triple threat that are eating Israel from the inside… , and waving a white and blue flag does zero to fix any of that . A properly-established court in a democracy will normally only overturn or ban or place restrictions on people and groups when it has been persuaded that they have broken or plan to break the law. The NGOs are perfectly free to defend themselves in courts with evidence. So it is hardly Fascist to bring reckless or dangerous NGOs to court. If Im Tirtzu cannot persuade the court of wrongdoing, their claim will fail. In a context where such a vast array of left-wing groups and individuals work hard to delegitimize the Jewish state with the intention of joining hands with Muslim organizations or terror groups in the destruction of Israel, we should all be grateful when Im Tiurtzu and others act against them. This is not a simple conflict between political positions. There really are large numbers round the world who want to wipe out Israel, some politically and legally, others by violence that could end in mass slaughter. Why should Yachad et al get away with their vile support for the anti-Zionist and, in the final analysis, anti-Jewish brigades? Dennis I have the greatest respect for your observations. You are one of the VERY FEW experts with a well-studied and deep knowledge over many years unlike many “experts” who act out of personal opinions and media reports. Bravo! A voice such as yours always adds a sober and comforting wisdom. It is very disconcerting to read about people’s badly resourced facts which lead to slogans of “fascist” are being slung around. My next 2 duplicated replies refer to Aelfwin and not Dennis ! Your last two paragraphs reveal an extreme intolerance and distortion which makes a convincing and plausible article, up to that point, unconvincing: Harsh and generalised attacks on these groups mentioned in your article display an intolerance which is no different from that which they are being accused of. These 2 above duplicated replies are referring to Aelfwin and not Dennis. How many people have you managed to convince with this load of prejudiced quasi-intellectual rubbish? One could be forgiven for thinking that as far as you’re concerned, only your opinion counts; that you are the fount of all knowledge on these matters; and apparently it’s ok for quislings like Yachad to peddle their anti-Israel propaganda but God forbid someone should want to offer a contrary view. Now THAT’s fascism, the totalitarianism which underpins liberal-left thinking (although I’m not sure that ‘thinking’ is the appropriate word). In many ways, the current scenario is similar to the factions that were fighting for independence in 1947. The Irgun and the The Stern Gang, to mention a few. We all want a resolve to the problems in Israel, but us Jews always have tow answers to one question. We have the same aims but different paths. I take a very simple approach to the whole situation. I believe that as a diaspora Jew I have a self-imposed responsibility to do what I can to protect the State of Israel regardless of which parties are in power and to defend it from attacks by those who wish to destroy it. I also believe that only the citizens of Israel have the right to decide what government they think is best to protect their interests. I find the attitude of the liberal-left – ‘we’ll support Israel but only if it does what we tell it to do because we know best’ – totally and utterly abhorrent. If people like Aelfwin and ‘progressive’ (???? )’organisations like Yachad believe that they have the solution to all the problems facing Israel, let them present this to the citizens of Israel and see how they respond instead of simply seeking to undermine Israel’s standing amongst diaspora Jews (and non-Jews) at every available opportunity. Very well said! One thing this kind of battling against a fellow Jews right to talk freely does is undermine the very essence of Judaism: Love your neighbour as yourself and Be a Light unto all Nations. We have a responsibility every second of every day to practise these and bring the elevated Moshiach Consciousness to the whole world. If someone ( I’m talking about fellow Jews) doesn’t behave in this way then he/ she have deviated from the core and purpose of what the Jews’s purpose on this earth is about. The ultimate aspiration of any Jew needs to raise his/ her consciousness to the highest level of Love and Chessed possible. By being an activist this needs to be written on the forehead and heart internally all the time; resorting to nastiness and back biting of another Jew weakens our purpose on earth as Jews, Hebrews or Israelites: this was gifted to our ancestors by God and passed to us by our Patriarchs. “In house fighting which comes from ego driven intolerance makes the perpetrator lose his/her spiritual strength and guilty of perpetuating hatred rather than Love. Feel the left silences debate whether in support of Israel [like I-m T-I-r-t-z-u] and of Torah Giants who support family values like Rabbi Yaakov Ariel. Yachad / NIF / Jewish News labeling Im Tirtzu fascist while denying it a platform to speak is beyond parody but no one should be surprised by this predictable development . Like the Corbynistas who speak essentially to themselves and do not represent the aspirations of the majority of Labour voters , likewise Yachad and NIF who seek to subvert genuine Zionism substituting their own Zionism lite version . It does not tally with the views of the vast majority of Diaspora Jews , but as with Corbyn and Momentum that will not stop Hannah and her cronies . After all , she does know what’s in Israel’s best interests . And she gets paid a lot of money for projecting her message. Charlie do you really want to get into who gets paid for what ? Only suggesting that her motivation might be money as much as hatred of the Israel that she and her fellow-travellers do not like and seek to denigrate at every available opportunity. Our synagogue is being represented. We Are a very pro Israel shul and zionists very welcome. I presume by ‘our synagogue’ you’re referring to HGS. If so, why was the booking cancelled? If not, to which shul are you referring? Don’t hold your breath waiting for an answer . Our synagogue and HOs is being unfairly MISrepresented. We ARE a very pro Israel shul and Zionists Are very welcome. Words with absolutely no substance. I expect more from a rabbi. What were the reasons for cancelling this meeting? Who made the decision? Why was the booking accepted in the first place? If HGSS doesn’t side with any particular political position, why did it cancel this meeting? Has it ever cancelled – or refused to accept – a meeting organised by Yachad or any of its fellow-travellers? Rabbi Kaplan – Zionists are obviously NOT welcome because you cancelled Im Tirtzu. Saying it does not make it true. Words are cheap. The event was cancelled for various reasons. HGSS does not side with any particular political position. It stands firmly behind Israel and its membership are great supporters of Israel. The reports are exaggerated and unfair to a wonderful community and its leadership. The problem is not you, nor is it the many members of your shul who I understand are staunchly Zionist. The issue is that a call to the synagogue by NIF and Yachad to reconsider their support, seems to have worked. Further, it seems that supporters of NIF /Yachad are on the shul’s management team. There is nothing wrong with that in principle, however if they are using their position to excerpt influence over the political opinions allowed within the shul, then you have a minority group, with a minority opinion unfairly influencing what the majority are allowed to hear. This is not an issue restricted to your shul. In some progressive shuls we hear anti-Israel rhetoric every Shabbat. We are also witnessing it outside of the community, on campus, in unions, in schools. It is part of a revisionist, politically correct and historically / factually inaccurate rewrite of history. Just as Jewish students are being cowed into silence on campus, Jewish Zionists are now being silenced in the halls of our own community. As a Zionist community leader, I appreciate you need to reflect the general consensus of your community. You also need to stand up for what is right and the truth. On this occassion, it does seem as if a few left wing activists have unfairly ousted one of Israel’s most active groups on Israeli campuses. Suddenly we are not allowed to hear what they are telling israeli students all over Israel. That they are politically active against the very groups that have censured them, makes this look like an extremely ‘targetted assasination’. It appears your shul also holds events sponsored by Yachad. How can this be the case considering (as you know) Yachad are also an extremely controversial group in our community. Given Yachad also only represent a tiny minority opinion in Israel (Meretz +) it is odd that controversy can be used to cancel ‘Im Tirtzu’, yet leave ‘Yachad alone. I am disturbed by your claim of misrepresentation. I have laid out the case as I understand it. If I am wrong, please show me where and I will gladly make any edits neccessary. This entire case has sadenned me. I spend much of my time on campus, watching the fight against Zionism there. I half expect to see it in some of our more progessive shuls… What I am shocked by is that it is entering our heartlands. It is a bad sign. Jewish News, Yachad and The NIF all threw the word fascist about freely. I only see one side over here trying to stop the other side from talking. Some of these seem to be on your management team. They have brought shame on your synagogue, shame on British Jewry and shame on anyone else involved. Denying freedom of discussion is bad and sad.. All points of view should be encouraged to be heard and each of used should be prepared to change our stance and/or respect the views of others . 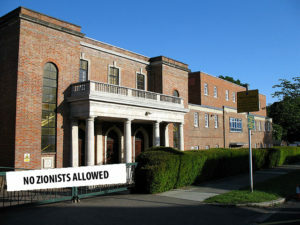 I am perplexed at the various insinuations that anti-Zionist views are frequently expressed in ‘Progressive synagogues. Perhaps sometimes such remarks may be taken out of context but if they are expressed and are unacceptable, surely those who hear them should make it clear that they are not representative of the members of the congregation. To listen in silence and not respond is a serious sin of omission.There are issues in Israel (and here where we live too!) that may need to be viewed with compassion, even if we prefer to turn the other way. Indeed, we will only expect to be taken seriously if we are able to understand difficult issues and face the consequences of not accepting them. To clear up a few facts, as far as I’m aware, nobody from Yachad or NIF contacted the shul to seek to censure, ban or boycott this event. I believe the HOs took the decision in response to concerns raised by members of the shul and Board members over the ‘controversial’ nature of the Im Tirtzu. As you rightly note, I’m also a Board member at HGSS – in my case, I was away on vacation when all this kicked off, and was only made aware of it when I was asked my thoughts on C4T and IT by one of the HOs (which I duly provided)… one of many views I think they garnered. In terms of this being a ‘freedom of speech’ issue, I think we’re in agreement that nobody should seek to limit anybody else’s freedom of speech (I hope you appreciate the irony that that seems to be precisely IT’s raison d’etre). However, freedom of speech does not imply an *obligation* to provide a platform. For both of us, I am sure there are individuals and organisations to the left and right of us whom we strongly disagree with but whom we recognise are part of the legitimate fabric of debate on topics. Then there are groups that we consider beyond the pale; whose views we think run counter to promoting legitimate debate… they promote violence, they delegitimise, etc. Exactly where we draw those fuzzy boundaries will differ from person to person. I personally place C4T in the former camp (I strongly disagree with them) and I place IT in the latter camp (they seek to delegitimise and demonise people). I imagine you feel differently and will place groups I can live with as beyond the pale. I think it is perfectly right and proper for a shul to try and promote a broad a range of opinions, but also to place limits (on both the left and right) so as not offend its members, In the case of HGSS they have placed IT outside that range. You may be interested to note that C4T however have sponsored and run events in the shul (only last month). The ‘Yachad event’ you refer to is Professor Yehuda Bauer speaking on antisemitism… hopefully you find that acceptable. I imagine if I tried to bring BtS to the shul I may be rebuffed. Hey ho… that’s just part of maintaining shalom bayit within our community. Thank you for taking the time to respond here. Yes, it seems we are at odds again. Unfortunate, as I do not consider ‘Yachad’ to be the enemy. So let me just clarify something first. I do not stand in opposition to Yachad, nor do I seek to silence them or any Zionist group. I do find your comments a little deflective to be honest. It is a little ‘sharp’ to suggest nobody from Yachad contacted the shul, when any action taken by a Yachad activist may well have been directed through the original Jewish News article. You cannot on the one hand push the button and on the other deny responsibility for the outcome. So please let us not engage in a pointless exercise of pretending the aim of the article wasn’t realised by the actions that followed it. Of course I see the irony of the Im Tirtzu / Freedom of speech issue. If we were in Israel, I would probably be blogging to protect your rights, not theirs. I do have a problem with international funding and believe transparency is vitally important, but I do not consider some of the methods / tactics/ strategies employed by those on the right to be at all acceptable. I do not consider UKIP’S Brexit immigrant poster to have been acceptable either, but hardly worthy of denying them a platform. Hiding behind words like ‘provocative’ or’ ‘controversial’ is meaningless. Anything is controversial if there are people that oppose it. It’s a keyword used to make a problem seem bigger or a group seem worse than it is. So of course Freedom of speech is not absolute, but I would be interested in hearing exactly what specific issues / policies ‘Im Tirtsu’ put forward that have negated their right to be heard inside a synagogue in the UK? Because this is the core issue. ‘Im Tirtsu’ are marketed as an educational movement and are I think the largest of their type on the Israeli campus. There are Israeli MK’s with views worse than those ‘Im Tirtzu’ put forward. Should these be banned too? Because that is really the point isn’t it. There are groups and people with more extreme positions that you wouldn’t try to stop. So it is more about the identity of the group and their targets than their actual position. I seriously would like to hear a specific example of the exact policy that made them “beyond the pale”. And it is here that I felt I had to take exception and become involved myself. What Hannah and Adam did was an absolute rejection of their own core values. Yachad effectively did over here *exactly* what they accuse Im Tirtzu of doing. Demonisation, delegitimization, removal of the platform etc. Now if Yachad suggest such actions in Israel make Im Tirtzu fascists, then what exactly does that make Yachad actions on this occasion? Look, I seriously am not looking for a disagreement with you or Hannah. My political position is probably not as extreme as you may think, and having lived 19 years in Israel, I am more than capable of separating the reality from the dream. The situation today is difficult and there are complex issues in Israel that do threaten the nature of the state. It isn’t that I don’t get it. If you ever fancy a chat over coffee – let me know. Also as I have stated openly, I fully accept Yachad as being a *legitimate* part of the discussion. A conversation with Ronnie Barkan also made me view some of Yachad’s activities in a more positive light (irony – huh..). But the action here was so wrong, unnecessary and divisive. Jews in a shul… come on, if we cannot talk about these things in HGSS, then where are we safe to talk about them? In truth, it damaged the synagogue, it damaged Yachad, it didn’t do any favours to C4T. And in future people will use guilt by association to paint me as an extremist. Everyone lost. It was all so unnecessary. For what? To shut the mouths of your opposition? This was really an own goal scored by a community which already has enough problems to deal with. Are Yachad really that petty, that desperate for attention? As for what I personally find acceptable. Well I spend a lot of my time travelling on campus and listening to Ben White, Illan Pappe, Max Blumenthal, Haim Bresheeth and so on. It takes a hell of a lot to wind me up these days. Wishing you well & Shabbat Shalom. I was one of the HGSS members who wrote to our shul arguing that Im Tirtzu should be banned. I don’t like their political position, but that had absolutely nothing to do with my request. As Rabbi Kaplan says, our shul has a proud tradition of allowing debate across the political spectrum and to the best of my knowledge we have never banned any group on purely political grounds – certainly not a pro-Zionist advocacy group. That would be a ludicrous. This issue is a simple one. Are there any grounds on which a shul might legitimately ban an organisation like Im Tirtzu whose message – in and of itself – is well within the spectrum of acceptable views on Israel? My answer – and I guess in principle you might agree – is that a group that uses morally outrageous tactics to pursue acceptable goals (whether on the right or the left) should not be given houseroom – and certainly not in a shul. If you are with me on that, then the only question is whether, as a matter of fact, Im Tirtzu’s tactics fall in the morally outrageous category. This is not the place to analyse the evidence and in any case the judgement is necessarily subjective. Suffice to say that having looked at their nazi-style posters, their vituperative videos, the language of some of their campaigns (branded by the anti-defamation league as ‘hate speech’), I felt that their tactics (not their political stance) fell squarely in the ‘morally outrageous’ category. I think that is also the thrust of Gideon’s argument and I suspect also of other objectors. May I suggest that that judgement (i.e. morally outrageous tactics or not?) is the only one worth pursuing. All this talk about denying a voice to people you disagree with is a complete red herring. Nobody has ever suggested that. Thank you for your response. Firstly is it safe to assume that you are an Emeritus Professor of Social Research in the Department of Sociology at City University London? One of the leading resarch team that put together the independent academic research on British Jewish attitudes towards Israel that was funded by Yachad? It now seems you may be one of those that politically react, when the NIF or Yachad presses buttons. Thank you for highlighting this. Secondly, you have just created a rather sickly straw man. The *only* issue you wish to accept as being relevant, is whether ‘Im Tirtzu’s tactics fall into the highly subjective ‘morally outrageous’ category. What you oustandingly claim is that ‘denying a voice’ or the freedom of speech argument is a ‘complete red herring’. As I am sure Gideon can tell you, Breaking the Silence are accused by some of using ‘morally outrageous tactics’. Some Zionists, believe their actions actually endanger the lives of their children. Others believe that some left wing groups take funds from enemies of Israel and persuing ‘legitimate aims’, distort information, potray Israel as a Nazi state and strengthen radical Islamist Hamas. Would HGSS feel perfectly at home hosting these people? When self righteous, elitists begin to close doors to legitimate arguments on the grounds they are ‘morally offended’ by the others actions, we begin to live in a state that bans burkini’s, shuts down speech and will soon have gangs patrolling the streets. It isn’t a one way street, it is a spiral. What is horrifying about the latest turns towards such censure is that much of it is arising in the left. It is a complete and utter rejection of the core values of providing a platform to free speech. Believe me, Yachad do not want to open a new front by beginning to deny Zionists a platform here. However much they may not like them. As for your vitriolic against Im Tirtzu. Using the terms you do’ such as ‘Nazi’, is simply a way of making something seem worse than it is. ‘Nazi’ is a meaningless term in this context, we all make our enemies out to be unpalatable. It’s cheap and like with Gideon’s use of ‘controversial’, is always used as an excuse to deny someone a platform. I am going to the event because I want to see their argument. Even if up till now, my thoughts on the group may resemble yours. Which attitude is the more enlightened, the more likely to result in ‘correct findings’? The truth is it seems you personally deem it okay to deny someone a platform without actually turning up to hear what they had to say. You did it because ‘you’ve seen’ stuff they did you didn’t like. And you happened to do it against a group that stands in direct opposition to a movement that used you to conduct independent research. This is the world of the left in 2016. The freedom of speech they offer us. Wow. I will be honest, I am shocked that it was you that responded. As you seem to have a direct line into Yachad’s central brain, may I suggest the following. I want to spend my time looking at Israel’s true enemies. I research anti-Zionism and antisemitism on campus. I do not expect nor want to have to deal with anti-Zionist activity from friendly fire. We do not need a war of attrition taking place inside our synagogues. Nor should individual subjective ‘morality’ override our basic freedoms. Please tell them not to do it again. And as an academic, you should have known better. How can a Jew talk of another Jew as having ” nazi- like tactics”??? I suggest that you take more care if the words you use especially as you represent a Shul. I think your words are lashon hara. May Hashem forgive you !!! You did, by your actions. You denied a voice to the people you disagree with because you’ve decided you don’t like the way they go about disagreeing, hiding behind a spurious cloak of ‘moral outrage’. That tells me all I need to know about the totalitarianism of the liberal-left – ‘I’m going to deny you freedom of speech because I don’t like the way you say what you say’. Are you suggesting that you are the arbiter of what is acceptable and not acceptable and that ALL organisation should seek your approval before publishing anything? And what gives you the right to impose your ‘moral outrage’ on others? I’m still waiting for a full explanation from the Board of HGSS as to why this meeting was cancelled and who actually made the decision. And I’d like to know why it was left to Rabbi Kaplan to defend their decision. Perhaps you could provide this information. The only comment I’m going to make are the anonymous names supporting the Yachaduk and the audacity to support a ban on an Israeli Organisation that spend their time making sure other NGOs who delegitimise Israel are absolutely exposed along with their funders . roads lead to the same people that wish to see Jews kicked into the sea . Hannah Weisfeld ? What was she doing at an inquiry into Antisemitism ? Her organisation has nothing whatsoever to do with Antisemitism ? Is she a momentum member ,? I applaud your desire to focus on Israel’s true enemies. But it doesn’t help to draw a series of straw men across the debate. I will respond to the straw men here, in the hope that this does not trigger another series of tangential irrelevancies. Then I return briefly to what I think is the central issue, which you have hardly touched on. 1. Yachad has pressed no buttons with me. I wrote to the shul only because a friend who is not part of Yachad sent me a flier for this event – and I thought it was wrong to allow Im Tirtzu to be associated with HGSS for the reasons I set out. Not only did Yachad press no buttons, but I didn’t even know they were campaigning on this matter, or involved in any way, until someone told me in shul yesterday. 3. Much as it may not suit your conspiracy theory, it is a coincidence that I did some professional work for Yachad and also wrote to the shul. As I say, I didn’t even know of Yachad’s interest and I would (and have once before) written to the shul when I felt it was allowing something beyond the pale. A shul is a community – an extension of our homes – and I’m not sure that choosing who you invite in to speak is in the same territory as the state banning of free speech as you try to imply. 4. But as it happens I agree with you that banning speakers on the grounds of moral offence is an objectionable and very slippery slope. The question I asked you, which is central to this debate and which you have not answered, is whether you accept that there are, nonetheless, limits to that principle. I cannot imagine that you would argue that Im Tirtzu should be allowed to present its (legitimate) views in a shul if it had a history of physically attacking its opponents, for example. Do your fine words about not allowing “individual subjective ‘morality’ to override basic freedoms” mean that anyone can present their views in a private place however they conduct themselves? 5. Assuming you are not advancing that position, then as I say, the only question is whether Im Tirtzu’s conduct, not politics, falls beyond the pale. That is a long debate, and at the end of the day I doubt that we will agree. But it would be nice if you could accept that that is the core issue; i.e. that IF Im Tirtzu’s tactics were judged by reasonable people aware of their conduct to be morally outrageous, then they should not be invited into our shul. And yes, that would mean denying them free speech in our community. Thank you for your response. So we do not become over burdened with irrelevance straw men and so on, I will cut to the very issue you suggest I have avoided (number 4). Of course there are always limits to free speech and the granting of platforms. Nothing is absolute. The question is surely over ‘moral offence’ rather than as provided in your other examples “physical attacks”. I would argue perhaps that in the UK the law is the provider of such freedoms, and it is therefore incumbent on the law to protect them. If a specific action crosses the line of legality (as in hate speech, physical violence, harassment and so on), then you are left with options as to how you address such transgressions. (I accept here too with are still left with subjective laws and fashions). What I cannot accept is that my right as an informed adult to hear a group from Israel (and let’s be frank, for better or worse they are an organisation with clout) has been impacted because apparently they morally disturb’ others. This I see as an unnecessary (and childish) breach of freedoms. If you don’t like them and are not interested in hearing what they have to say, don’t go. What has been closed down on this occasion isn’t violence or actions, it is words. So yes, we are disagreeing over if ‘Im Tirtzu’s conduct’, falls beyond the pale but also, and additionally, whether that situation warrants a denial of a free platform. You cannot separate the two. I do believe I understand your argument, I simply fail to see how you can separate the crime from the punishment. Just because I might agree that someone can find a particular issue offensive, doesn’t mean I lose the right to argue the manner in which they deal with the issue is grossly wrong. Nor does it deal with another central issue. If more people in our community believe BtS are morally offensive than Im Tirtzu, are you suggesting we shouldn’t give a platform to these groups either? Who plays the moral judge here? Considering this group (Im Tirtzu) are bound to rile certain activists, and aknowledging that they are on every campus in Israel, I do believe there is a fair amount of delegitimisation going on. I should have been allowed to go to HGSS and hear them speak, so as to judge for myself. Yachad should not have got involved, it was wrong of them to do so, it is an attack on free speech (how can it be viewed otherwise) and I believe it may well backfire. We did not need this in our community. I think David has said it all. It’s a pity that a synagogue wishes to “nanny” the community by censoring what it might hear, presumably it assumes they are simple- minded and likely to be infected by views not held by the synagogues board. I thought argument and discussion were core Jewish values. OK David. Thanks for addressing the core issues I raised. I think I now understand why we disagree, so a further rejoinder. 2. I hasten to add, that this was NOT the basis of my objection in the case of Im Tirtzu . As I hope you now accept, I didn’t seek to prevent them speaking because of their views. That wasn’t an issue. On the contrary I would have been quite interested to hear what they had to say. My objection was to giving a platform to a group that has behaved towards other people in a manner I regard as shameful and that I judged to be wholly at odds with our shul’s moral values. And I don’t accept that just because the moral offence arises from conduct short of violence that it can’t be a basis for exclusion. 3. I accept entirely the problematics around who decides. In this case, I presume the shul’s HOs decided on the basis of the Im Tirtzu videos, posters and texts that I (and no doubt others) sent them. But it cannot be an argument against drawing a moral line, that people may disagree about exactly where to put it. That way lies moral chaos. 4. You seek to conflate the morality of a group’s views, with the morality of the way they conduct themselves. I think there is a world of difference between their political philosophy (which is fair game for debate) and the actions of those who vilify, demean and lie about their opponents. I know you don’t accept that the latter applies to Im Tirtzu, but you also seem to be saying that one can’t even make the distinction. Here again we will just have to differ. 5. One thought to come out of this, is whether the left and the right on Israel could agree some principles about the acceptable basis for discourse and debate. Without that, I fear that we are moving towards a kind of intellectual civil war which will diminish both sides. You are confusing issues. I am not denying you your right to protest. And most of what you have been saying is expanding on your right to oppose or criticise Im Tirtzu. On the one hand you keep referring back to your case (your objection – which is legitimate) and then crossing over to discuss the denial of the platform, as if the relevance of one has anything to do with the other. Regarding the Shul and set values. We are discussing a group in Israel that exists and operates inside every university. As much as your ‘tiny little clan’ (and let’s face it, that is the size of the community you represent) would like to have it otherwise, Meretz, and perhaps a couple of extreme left wing members of the Zionist Union, do not have, nor will they have a significant following. I have no problem with accepting that Yachad present a legitimate argument. I do have an issue with a well-funded but tiny group of self-righteous individuals, believe it is their duty to create a moral police force that attempts to enforce their values and their standards on everyone else. This is exactly what Yachad have just done. They are not referring to a ‘synagogue’, so the creation of a specific argument over HGSS is a straw man. If this is not a request for an absolute denial of a platform, then I do not know what is. It is ironic that a movement that squeals consistently about ‘free speech’ seems so ready to deny that right to others. Im Tirtzu have taken up a position that attempts to counteract some of the distortion that it believes the New Israel Fund disseminates into Jewish education. As such they themselves become a target for delegitimisation. This is not to say they have not made mistakes or crossed lines, but it does suggest that their natural political enemies will exploit such mistakes by using them to remove their right to have a platform. It is the way fascism works. There is a war taking place between Zionism and anti-Zionism. Im Tirtzu are a Zionist organisation. They should be allowed to come to the UK and explain to the Jewish community here what there issue is with the New Israel Fund, to bring evidence that they have and to talk to us about the situation. Fear is a great driver in attempting to deny a platform. It is absolutely ridiculous to even being to pretend that the *FACT* that New Israel fund and Yachad have opposed Im Tirtzu’s presence has nothing to do with their activities against those groups. It is a direct and targeted political assassination. It is easy to attempt to side-line the discussion by engaging in philosophical discussions over the rule of law and the ethics or morality of subjective positions. Fact 3. That platform was denied because of that attack. One thing of interest before I go. One of the major problems of the left currently in Israel is that it has no constituency. It doesn’t really have one here either. What it does do, is consistently over-state its own power, this despite every few years, elections in Israel proving the true state of affairs. Last week, Netanyahu invited reporters to listen to a talk. It went on for some time and many of the reporter’s present were of the left. At the end of the session, some of those, including for example Gideon Levy, were complimentary about many of Bibi’s characteristics (not his policies). One journalist, Shai Golden suggested Netanyahu was a ’giant amongst gnomes’. The reason I mention this, is because for that comment, Golden was forced to pay a massive price by his colleagues in the media. Golden is anti-Bibi, identifies with the left, but simply stated what he believed to be factual. That at present, Netanyahu, for all his failings, is clearly a superb politician. Golden has been writing posts on Facebook to update people on the attacks that he has been experiencing. He has suggested the left are acting like ‘thought police’, where if you do not ‘obey’ and ‘follow the exact line’, you are instantly castigated and demonised. I think it absolutely disgraceful that Yachad made a call to remove Im Tirtzu’s platform. It was a direct attack against Zionists, Zionism and me personally. I wanted to go, I wanted to hear, I wanted to listen and Yachad wanted to deny me that right. At the moment, all I have heard is long winded excuses about how everyone was out of town and the HGSS decision was perfectly legitimate. It wasn’t. It was a disgraceful fascist style attack, and a replication of the very tactics that Im Tirtzu have been accused of using. If it makes you all sleep better at night, you can try to convince yourself otherwise. Or you can reaffirm your superior ethical position to yourself, that I am simply ‘too extreme to understand’ and you can gather together for tea (all 5 of you) and mutter to yourselves about how a silent majority (that doesn’t exist) absolutely all agree with you. Have you ever asked yourself the question, why it is that Israelis (almost all of them), those that live over there and experience the reality, all think your position has no merit? Why all the olim that go over there, all end up voting the same way that Israelis do. As someone who lived through both Intifada’s, Oslo and Lebanon, I know. It’s a nonsense, and all I have heard here, just reaffirms that what occurred at HGSS was a disgraceful episode. I will work hard to ensure this is never repeated. The event is not cancelled – only the venue is changed. Security will be tight, so if you want to defeat censorship and make your own mind up, please click the link and book now. Now we’re back full circle. But with dozens (well maybe 6 at least !) new straw men. I can’t begin to respond to all these new arguments substantively. So let me give you just the bottom line for three or four – and I will have to leave it there. 1. The legitimacy of Yachad’s position. Irrelevant to our interchange. My original posting was intended to say why I believe my actions were justified and why the outcome is justified. Surely you don’t expect me to now start defending Yachad’s actions – I don’t know what they did, I don’t represent them, and I was unaware of their campaign when I tried to do what I thought was right. How on earth do you know that the talk was cancelled because of Yachad/NIF? Knowing our shul I think that is very unlikely. But in any case, what has that got to do with me? All we know is that agent X, acting as you accept independently and properly, contributed to an outcome which he claims was entirely justified. You can’t in logic dismiss X’s arguments on the grounds that you don’t like the tactics of agent Y who happened to want the same outcome (and who probably played no part anyway) . Totally irrelevant to our discussion, but utterly wrong as it happens. At least three major surveys (and yes, I was involved with other professional researchers in all of them) demonstrate that very dovish positions on settlements, recognition, Palestinian rights, Israeli tactics are shared by a clear majority of British Jews (who incidentally also express overwhelming attachment to, and pride in Israel). Couldn’t agree more. An organisation employing allegedly fascistic tactics wants to speak at our shul. Some of its members protest and the shul says no. You cry foul because it is a Zionist organisation and apparently must be allowed to speak wherever it wants and whatever its tactics! The ONLY sensible basis you can have for objecting is that the label “fascistic” is wrong – and I am happy to discuss that. Everything else is just hot air. “Zionist” is not a get out of jail free card – and the existence of anti-Zionists does not make all Zionists our friends. 5. Campaign4truth says it all. The event is happening elsewhere. i.e. this is nothing to do with free speech. It’s to do with the free choice of a private body to reject an unsavoury group who happen to be Zionists. Don’t try to load onto that issue, your complaints about Yachad, NIF, the left in Israel, the left here, the war between Zionists and anti-Zionists (on which we are on the same side) and who is demonising who. 1 I am aware you do not in this exchange represent Yachad. Their recent anti-Zionist actions (this is not the first) are for them alone to attempt to explain and defend. 2 If we are to have a reasonable exchange, we should at least not choose to hide behind convenience. It is highly unlikely any rejection of a platform would have occurred without Yachad’s call to ban Im Tirtzu from our shores. At a certain level of probability, you accept the hypothesis. What we do have is a public call by Yachad for the ban and an admission by you that you also made this call. As I am aware your little clan’s bubble does not spread very far, it is safe to assume one is related to the other. 3 You are doing what all small clans do to exaggerate their fan-base, you include people who are not your fans. Yachad are not Zionist Union, nor any of the many people (myself included) who would be willing to make massive territorial compromise if peace were possible. I would have followed the trend in your survey and it is outrageous to suggest a dovish position on all those issues in any way signifies support for Yachad. It was of course politically pushed that way, and you betray your own claim to independence by taking the ‘unbiased survey’ and use it to mistakenly draw the same political conclusions. So as to force home this point, I will say this: Israeli politics is split mainly on the lines of ‘who is responsible’ and ‘what can be done’. Most centrists would like to take have peace, are uncomfortable with some Israeli actions, and do not fully support settlements. How can this position EVEN POSSIBLY be described as Yachad position? It was a disgraceful political abuse of an interesting survey. I am not Yachad at all, nor anywhere near the extreme left camp. Yet your survey would it seems (according to your own declaration) have placed me in ‘your camp’. How do you explain this anomaly? 4 You denied people a platform with limited knowledge, biased input and a clearly political agenda. It is shameful however you try to wrap it up. That it comes from the liberal left makes the hypocrisy incredible. 5 I do not care that the event is still happening. That some people do not have the hypocrisy of Yachad and foolishness of the synagogue does not give everyone a get out of jail free card. As I said earlier, to be honest, I have little interest in your action. Your right to protest is as solid as Im Tirtzu’s right to speak. I cannot nor do I want to be seen to be denying you that right. My fight is against Yachad who have made yet another anti-Zionist action and the synagogue that foolishly fell for Yachad’s delegitimization process and allowed their politically targeted assassination to go ahead. Who is demonising who? Well let’s start with the fact that by referring to C4T as an ‘unsavoury group’ you are demonizing them. Or does that not count in your book since you obviously disagree with their position? Are you morally outraged by them? Which other groups or organisations are you and your fellow-travellers morally outraged by? I also note that you are now referring to the tactics of Im Tirtzu as ALLEGEDLY fascist. Anything to support such allegations? And when you refer – as you did earlier – to ‘reasonable’ people being outraged, who exactly are these reasonable people? This is the defence of the charlatan who claims ‘everybody knows’ without providing one iota of evidence. And who decides who is and is not reasonable? You? Me? Such arrogance to imply that everyone who does not agree with you is unreasonable. Whatever way you look at it, HGSS denied Im Tirtzu freedom of speech because you and people like you disagree with their message; but you know it’s unacceptable to say that so you try to hide behind the cloak of ‘moral outrage’ at the ways they express their messages – to my mind, just another example of left-wing totalitarian tactics to silence those who refuse to accept their party line. Shameful. Im Tirtzu once initiated a campaign that was criticised. Breaking The Silence has been criticised repeatedly. For example for pressing soldiers for operational details. The fact is that HGSS has no-platformed a Zionist organisation. That is a disgrace. Sadly the only ones to really benefit from this farce are those that obsessively campaign for Israel’s eradication . These people have long since recognised that the Zionist diaspora is a bulwark which supports , sustains and nurtures its irrevocable connection to Israel . If this can be undermined and a schism created within the Zionist community it would represent a far reaching moment in what is a long term strategy to break the ties that bind . Just read Barghouti , EI , White and others for their take . Tirtzu event at the HGSS ?? In the Jewish news article it stated quite clearly there were a number of Jewish organisations that were opposed to this particular organisation coming over to speak for us. Nobody asked us on for a meeting ? Nobody fund our organisation and to that effect we do not answer to anyone . Jewish left leaning organisations such as the JLC Yachad , etc were rather embarrassed when we exposed Hope not hate,A far left organisation well connected to boycott divestment movements and we campaigned against them holding gold green yellow against the Nazi demonstration in Golders Green , whilst pulling out israelinflags from the posts ..and in fact we were proved right when the Jewish Chronicle exposed Hope not hate being an anti-Israel organisation. It is laughable but truly it is got nothing to do With any of these established organisations has it? It’s a shame our community have become the totalitarian voice that we are trying to expose . The voices that shut down free speech . Our organisation will battle on supporting Israel , exposing her critics and we will collaborate with orgs and speakers whom WE wish to . Would allow you to attend one on occasion ? Pop along and hear for yourself. Make your own mind up. Don’t allow the thought police to silence those they disagree with. NEVER AGAIN will Jews be silenced, even by fellow Jews. David, I have only just read this speech. It’s late at night, I have to be up far earlier than is my norm to do a radio iunterview on rthe Home Affairs Select Committee report, so I must head for bed in a few minutes. But I want to add something to all the other things people have said. This has a clear impact in the Jewish community, and I’ve been aware of these rifts over many years. But as a complete outsider (as a non-Jew, but an insider as a Zionist) it still comes as a shock to see so many Jews playing silly games, blocking Zionist speakers and all the rest. This sort of things polays directly into the hands of the anti-Israel brigade, not to mention the (usually related) anti-Semites. It’s one thing for there to be varied opinions within the Jewish community, just as there are denominations. But Jews of all people should understand trhe significance of the Zionist enterprise and should certainly never work against it. To work against Israel means breaking down the rationale of self-determination for the Jewish people that Israel represents. It is as if the NIF, Yachad etc. actually want to see an end to Israel. We can put up with Naturei Karta et al, but this is genuinely dangerous. It is something I cannot explain to friends. Israel is all that stands at present between Jews and another Holocaust. I know Iran and Shi’ism all too well not to think so. Why on earth, it seems to an outsider like myself, would Jews want to work hand-in-hand with anti-Semites to acontinue the threat to Jewish existence? Israel’s enemies are, at bottom, the enemies of the Jews, both in the diaspora and in Israel. If Jews themselves cannot be friends to Israel, that gives free rein to the enemies, and that in a period when anti-Semitism is growing worldwide again. It baffles me, and it worries me that rthe Jewish leadership is so weak on these issues. By all means disagreee with Israeli policies or put forward alternative ways to bring peace (in which I wish Yachad et al the very best of luck, knowing they miss the point utterly), but to actually ban Zionists from shuls is, simply, treachery, and should be treated as such. This hasn’t just happened to us over IM Tirtzu but Dr Mordechai Keder and I’m sure any other “right wing ” or a “Zionist” org that doesn’t push the 2SS agenda nor Those who are critical of a likud government . Whatever the reason, there is still Skype and live feeds of every single speaker we can platform in or outside a united synagogue !